This sunflower cake fit perfectly with my niece’s country wedding theme. She mixed the yellow with turquoise to create a beautiful scene as you walked into the reception hall. A white cake with rich buttercream icing was the canvas for this simple design. 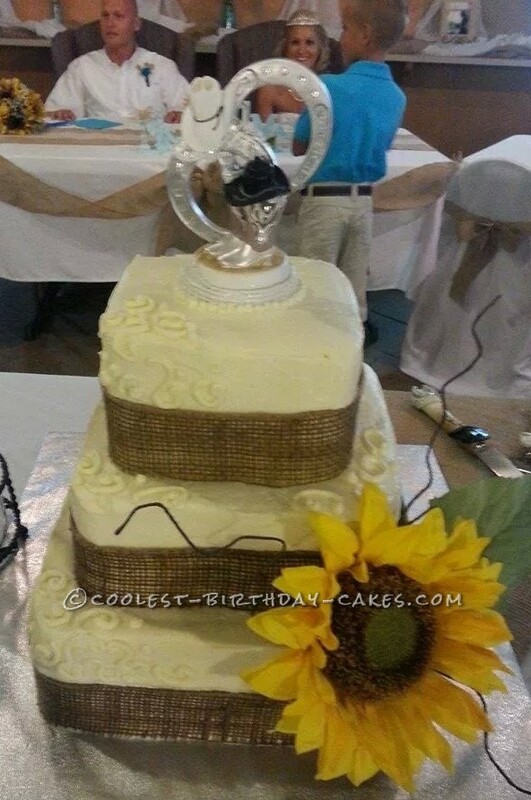 The sunflower is silk and the burlap ribbon molded easily to the cake. A few dots and squiggles and a cowboy topper finished off this sweet treat. The wedding was several miles from my home so I only put the bottom two tiers together for the trip. I was glad i did when I saw how curvy the road was between home and there. But with slow and easy driving (provided by the hubs) the cake made it just fine. I added the top at the church and finished up the details. I hope Jenn has many many years of happiness to come….and honored to have helped on her special day.